The first principal of the College was Prof. A. A. Memon (1963) under his able guidance the initial development and establishment of different buildings, offices and laboratories took place. Prof. Memon in real sense made continuous efforts and provided good initial foundation for imparting education, research and extension activities in the region. Since then the college had reputed, well-experienced and knowledgeable Principals & Associate Deans viz., Dr. T. Y. Patil, Prof. Pc. S. Duduskar, Dr. B. D. Khot, Dr. K. S. Pharande, Prof. R. B. Jadhav, Dr. R. G. Patil, Dr. B. B. More, Dr. B. C. Patil, Prof. S. A. Shende, Dr. P. M. Dhumal, Dr. S. S.Magar, Dr. M. D. Patil, Dr. A. M. Kale, Prof. S. T. Kenjale, Dr. Y. M. Shinde, Dr. R. D. Ghatage, Dr. S. H. Shinde, Dr. A. S. Jadhav, Prof. G. B. Gutal, Dr. D. M. Sawant, Dr. A L. Pharande, Dr. S. G. Borkar & Dr. N. Y. Patil who had strengthened the educational and developmental activities of the college. To impart education to the Under Graduate and Post Graduate students in various disciplines of agriculture. To undertake the need based location specific research activities. To disseminate research findings and latest knowledge of agriculture to the farmers. It has carved a niche for itself on the national and international scene. Among the Agricultural Colleges in the Maharashtra, the College of Agriculture is well known by virtue of its high academic standards, research achievements and effective transfer of technology. In addition, the students of this college have made impact at the national level through academic and cultural activities. Considerable progress has been registered in the field of agricultural education, research and extension from this college. In order to meet higher agricultural education relevant to present day needs to produce graduates with entrepreneurial skill for self-employment and contributors of rural livelihood and food security need is felt for reorienting agricultural education. In view of globalization and development of new technologies, it is essential that the students meet international quality standards. Based on in-depth discussion at university and national level involving different stakeholders, new curriculum has been designed. The main features include inclusion of new areas and increase in practical content through Rural Agricultural Work Experience (RAWE) and experiential learning modules where duration of which is for 6 months duration at VII and VIII semester respectively. Since 1963, the college has been entrusted a responsibility to develop human resource which will educate and disseminate need based agricultural technologies to the farming community of the State. Many students are being actively engaged in public and private sectors of the State. The human resources are being utilized for agricultural education, research and extension needs of the State and Country. The degree programme is of four year duration spread over 8 semesters. The evaluation is partly internal (20%) and partly external (80%). The credit requirement for the B.Sc. (Agri) degree is 160 credits and for the B.Sc. (Hort) degree is 163 credits, Out of which 20 credits are reserved for rural agricultural work experience programme (RAWE) and 20 credits for experiential learning module. To expose the students to the rural life and farming situations, the RAWE programme of VII semester has been introduced in the curricular of B.Sc.(Agri). During this period students gain farm experience of 6 months by staying in the villages. As per the Fourth Deans’ Committee recommendations the seven Experiential Learning Modules for VIII semester students are being implemented to make them practically capable in the fields of Seed Processing, Nursery Management, Farm Mechanization, Sericulture, Soil and Water Analysis, Bio-Fertilizer Production and Milk & Milk production. The post graduate programme leading to the M.Sc. (Agri) degrees in 7 disciplines namely Agricultural Entomology, Agronomy, Agricultural Extension, Agricultural Botany, Soil Science & Agricultural Chemistry, Microbiology and Agricultural Economics are offered. The M.Sc. (Agri) programme is of two years duration spread over 4 semesters. The student has to complete 50 credits, out of which 35 credits are allotted to course work and 15 credits to research (thesis) work. This college has maintained unique identity by producing a number of Agriculture Officers, Professors and Scientists. The college has made significant achievement in education. In the Junior Research Fellowship (JRF) examination conducted by ICAR New Delhi, 242 students are qualified. Seven students are selected as Agriculture Research Scientist conducted by ICAR New Delhi during 2010-11. Nearly 6750 students have obtained B.Sc. (Agri.) degree and thirteen students have obtained M. Sc. (Agri) degree. Agricultural Entomology, Agronomy, Horticulture, Extension Education, Agricultural Engineering, Agricultural Botany, Soil Science & Agricultural Chemistry, Plant Pathology, Animal Science and Diary Science and Agricultural Economics have separate office and laboratory buildings and provide continuous teaching, guidance and counseling to the students. Most of the Professors have achieved distinction in their respective field of specialization. The College has well developed infrastructures in terms of class rooms and laboratories. It has well developed computer lab connected with the Internet and video conferencing facility. The separate building for the College Library was constructed and inaugurated having 1160 sqm in 1998. It has a collection of 32302 books, 2900 Magazines, 59 scientific journals, 21 annual important reports and proceedings. The reading room is provided with Newspapers, Magzines, Radio and TV. The College also subscribes for 26 periodicals. A separate internet surfing room for boys and girls having software like SLIM++, CAS, are available at library. The students from scheduled cast and scheduled tribe are benefitted with the book bank facility which is available at library. The National Service Scheme (NSS) of students sponsored by the Ministry of Human Resources Development, Department of Youth Affairs and Sports, Government of India is in operation at the College since 1985. The unit is provided with 250 volunteers and two programme officers. The activities are twofold 1) Regular activity under which the volunteers have to complete 240 hours during two years of registration. 2) Special Camping Programme \, under which the volunteers are kept in a village for 10 days to participate in literacy, health, sanitation, construction of rural roads etc. National Cadet Corps (NCC) is attached to the 'D' Coy. of the 56 Maharashtra Battalion NCC. There are two pareds every week. Every year there is a camp during the December vacation. Students joining the N.C.C. can appear for the 'B' and 'C' Certificate examinations and can get commission in the Armed Forces. Under National Cadets Corps, 52 cadets were selected for various camp and the programmes like Tree Plantation and Blood Donation Camp are arranged by NCC. The research programmes of the college are mainly applied in nature for solving problems of farming community of particular location coupled with overall increase in agricultural production of the State. Emphasis is also given to basic research supportive to applied research for tackling fundamental problems. Adaptive research is also undertaken for developing and refinement of newly developed technology under farmers' field condition, validation and ensuring acceptance. Further, the research programmes of the college are oriented towards improving potentiality of various crops and related inputs and resources in agriculture. National Agricultural Research Project, Shenda Park, Kolhapur, Regional Sugarcane and Jaggery Research Station, Kolhapur and Agriculture Research Center, Karad, Kasabe Digraj, Radhanagari, Gadhingalaj, Central Sugarcane Research Station, Padegaon and Regional Wheat Rust Research Station, Mahabaleshwar are doing research work under the jurisdiction of this college. For the reclamation of saline oil, organization of special extension programme for adoption of green manuring crops such as Shevari and Dhaincha. In order to provide technical knowledge to the Drip users regarding use of proper method of declogging of emmmiters, it is recommended to providing suitable training to drip users. The rural youth are engaged in agriculture and allied enterprises like dairy but there are not having knowledge and skills. Therefore, it is recommended to impart in depth training to rural youths for developing agricultural entrepreneurship by the State Department of Agriculture in collaboration with Agriculture University. Need of training to finger millet producers regarding cultivation technology and value addition of finger millet. With a view, to transfer the improved technology developed through agricultural research programmes to test its viability and usefulness under real farming situations, College Development Block of about 62 villages which are attached to this college. The first College Development Block was established under the Department of Extension Education in 1967 at Karvir which consists 60 villages. Today, having eight Extension Blocks which consist 62 villeges of Radhanagari, Bhudargad and Hatkanagale, tahshil of Kolhapur district. The seeds/ planting material of improved varieties released by Mahatma Phule Krishi Vidyapeeth, Rahuri as per season are being distributed to the farmers, on the basis of ‘No profit - No loss’. The improved seeds like J. S.- 335, D.S.- 228 (Soybean) and Phule Samruddi, Bhogawati, Phule Radha, Indrayani of Rice and Tryambak, Tapowan, of Wheat and Vijay, Digvijay, Virat of Gram and Co-86032, Phule-0265, Co-92005 and Co-94012 of Sugarcane made available to farmer of the region. The CDB also serves as ground to transfer the improved technology developed through agricultural research programmes to test its viability and usefulness under real farming situations. The CDB organize various types of activities inclusive of demonstrations on farmers' fields for quick dissemination of technology. This includes introduction of crops, their varieties, improved seeds, seed treatment, proper sowing methods, fertilizer practices, irrigation water management, plant protection measures, use of implements, processing, marketing and storage. An efforts are being is made to introduce horticultural crops, animal husbandry and dairy programmes. It was established on 1st July, 2000. The scientists / teachers usually undertake extension activities either by themselves or in group together in different magnitudes. The REC staff visit farmers from time to time and provide help in giving on-spot guidance as farm advisory service, alongwith the help in supply of seeds and seedlings and organizing tours of farmers to different institutes engaged in agricultural research and development. The activities undertaken usually includes - field demonstration, farmers-scientists forum, to farmers' fields, visit to farm trials, group discussion, farmers rallies, exhibitions, answering queries through correspondence, transfer of technology, messages, articles in newspapers and magazines, radio and television. Many farmers have been received various rewards like Krishinistha, Sugarcane Bhushan, Udyan Pandit, Ideal Farmer, etc by State Government, Zilla Parishad and Department of Agriculture due to efforts taken by Extension Centre and Regional Extension Centre of College of Agriculture, Kolhapur. 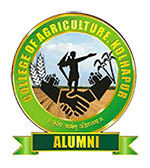 College of Agriculture while entering into Golden Jubilee Year, has registered considerable progress in the field of Education, Research and Extension. It has given major contribution to improve financial condition of rural and agricultural sectors.